Sascha Tege from the host nation won the 2010 German Open. In the final the 31-year-old surprise winner defeated current 8-ball world champion Karl Boyes (England) 8-6. The victory was worth €5000 and Boyes got €3300 for second place . In the semifinals Tege edged Raj Hundal (England) 8-7 while Boyes hammered Fabio Petroni (Italy) 8-1. This was Teges's first Euro Tour win. His previously best was fifth in the 2007 German Open. Tege is the fourth German winner in the last five editions of this event. Defending champion Ralph Souquet (Germany) was ousted 8-6 by Hundal in the last 32. For the second year in a row 10-ball was the game used in the event. The win lifts Tege from 111th to 80th in the Euro Tour Ranking. Losing finalist Boyes improves from 10th to fifth. Daryl Peach (England) is the new No.1, Niels Feijen (Netherlands) is in second and Mateusz Sniegocki (Poland) sits in third. All three improve one place. Former leader Souquet drops to eighth. 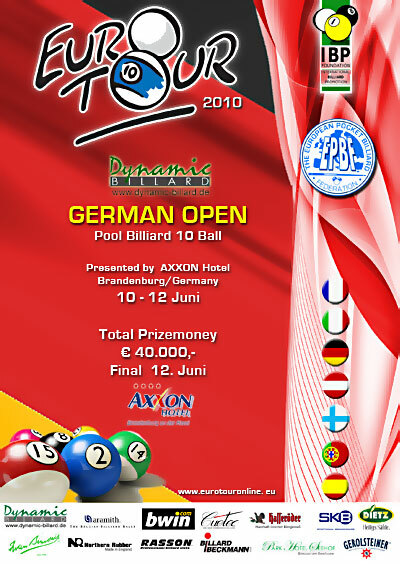 The tournament was played 10-12 June 2010 at the Axxon Hotel, Brandenburg, Germany. It was the third event of seven on the 2010 Euro Tour. Next up is the Austria Open which runs from 8-10 July 2010. Luca Brecel and Wendy Jans (both from Belgium) won gold medals in the 2010 European Snooker Championships. 15-year-old Brecel defeated Dutchman Roy Stolk 7-4 in the final of the men's event while home favourite Jans defeated Diana Stateczny (Germany) 5-3. In the men's semis Brecel beat Iceland's Kristján Helgason 6-3 while Stolk defeated Roy Fernandez (Israel) 6-4. In the ladies' semis Jans overcame Anna Mazhirina (Russia) 4-2. Stateczny whitewashed Germany's Natascha Niermann 4-0. 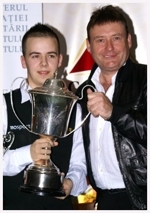 Brecel is the youngest ever winner of the European Championship. It was his third title in a short span. He also won the 2009 European U-19 Championship and recently added the Belgian Championship. It was Jans' fifth European title. She also won in 2004, 2005, 2006 and 2009. In addition she captured the 2006 IBSF World Amateur Championship. Defending champion David Hogan (Ireland) lost 4-2 to Roy Fernandez in the last 32. Former top pro Darren Morgan (Wales) won the Masters division. In the final he beat 2000 winner Joe Delaney (Ireland) 6-0. Morgan also won in 2007 and 2009. He opted for the Men's event in 2008, where he made it to the semifinals. Hogan and Kuldesh Johal (England) had the highest breaks of the tournament with 141s. The event was held 27 May - 5 June, 2010 at the Rin Grand Hotel, Bucharest, Romania. The European Main Tour play-offs (International Open) was played just before the tournament. Kurt Maflin (Norway) won the event to reclaim a place on next season's Main Tour.